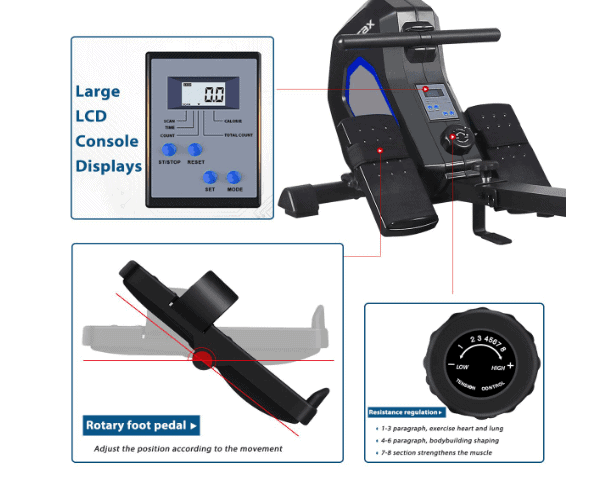 The Merax Adjustable Magnetic Resistance Rower is yet another brand’s product that has similar users acceptability level as the Merax Water Rower, however, the latter is as expected more expensive than the former. In other words, this rower seems to enjoy good recommendations by users on Amazon customers’ reviews. The rower is inexpensive since it costs about ¼ of the price of the high-end rowers and still has some interesting features and construction that make it suitable for home use. It is a full body workout machine that has a quiet and smooth operation that allows the user to enjoy a productive and entertaining moment. The rower is equipped with a magnetic resistance system that offers 8 adjustable levels. The main frame also known as the rail has 15-degree tilt angle that allows sliding forward to be easier and pushing backward to be harder thereby adding more natural body weight resistance that compliments whatever resistance level the user has selected for the workout. The rower is budget-friendly and possesses the features that allow you to perform result oriented full body cardio workouts in the comfort of your home. Click right here to have a peek at the discounted price of the Merax Adjustable Magnetic Resistance Rower on Amazon. The Merax Adjustable Magnetic Resistance Rower is designed for home use with solid construction that features a steel frame that could support 264 pounds/120 kg maximum user weight capacity. The steel parts of the rower are also coated with anti-corrosive and scratch paint that ensures their longevity. Other parts such as the shroud for resistance system elements and the stabilizer end covers are made of ABS material. It has good stability that ensures that no wobbling movement will be experienced even during an intense or vigorous workout. The base framework features front and rear stabilizer bars that are made of steel; and there are adjustable levelers on each end of the rear stabilizer bar which allow you to balance the rower on a surface that is not even, while the front stabilizer bar is equipped with transport wheels for portability and these are recipes for superlative stability. It weighs 68 pounds/30.8 kg which enhances its overall stability. The rower is considerably lengthy therefore will take up a little bit of space. It has overall assembled dimensions of 73 inches long by 16 inches wide by 21 inches tall. Differently put, it is going to need a workout area of 6’1’’ long by 1’4’’ wide. Moreover, there should be an extra clearance of at least 1 foot at the rear and on each side of the rowing machine for safety and convenience purposes. However, it won’t take as much space when folded up for storage. The rower basically reduces to more than half its assembled length dimension when folded and therefore is storage-friendly. As aforementioned, it has a magnetic resistance system that makes its operation to be quieter than rowers with air or water resistance system and it features 8 resistance levels that are suitable for anyone that wishes to lose weight and tone upper and lower muscle groups. The Merax Adjustable Magnetic Resistance Rower features an ergonomically contoured and padded seat that provides maximum comfort. This ensures that a user exercises longer with proper blood flow in the glutes and does not slip. The seat sits on a frame that is equipped with ball bearings that enable it to glide to and fro. The handlebar is coated with a soft rubber foam material that conveys optimum comfort that encourages the user to workout longer and prevents blisters in the palm. It is attached to a durable 1’’ nylon strap that does snap no matter the intensity of your workout. The Merax Adjustable Magnetic Resistance Rower is integrated with rotary large footrests that have safety straps on. These are suitable for users of different foot sizes and for the fact they rotate upward and downward a user should experience the comfort that is accompanied with full support for aggressive thrust. The Merax Adjustable Magnetic Resistance Rower obviously features a magnetic resistance system and there are 8 adjustable resistance levels that are suitable for an average individual that wishes to lose weight or improve overall physical fitness. It is important to note that the highest resistance level does not provide an extremely challenging workout, thus advanced athlete may not be impressed by it. The resistance system consists of elements such as a magnetic brake, a flywheel, and the tension knob. These elements work together to provide resistance without friction taking place. In other words, the magnetic brake does not come in direct contact with the flywheel in order to generate resistance but instead, it comes close to emit the magnetic field around the flywheel so that resistance will be generated. As a result, no wearing part and no part will be required to be replaced over time. The tension knob has the resistance levels –low 1, 2, 3, 4, 5, 6, 7, 8, +high indicated on it and it is used to easily adjust the resistance to whatever level a user wishes to use. You simply turn it clockwise to increase the resistance and turn anticlockwise to decrease it. When adjusted to a certain level it remains constant to the appropriated resistance level no matter how fast or slow your rowing is. It is not dynamic like the air or water resistance system that tends to increase or decrease by the intensity of rowing. Again, the resistance system provides light to medium workout challenge and it is smooth and quiet which allows the user to exercise at any time of the day. Family members or the neighbors won’t feel disturbed by your workout activity and you can also watch your favorite TV show without necessarily turning the volume abnormally up. The Merax Adjustable Magnetic Resistance Rower features a console that has a little more than the basic. The console features an LCD monitor that tracks time, stroke count, stroke total count, and calories burned. It also offers the opportunity to set up goal target count down for time, count and calories burned. It has very good visibility but could be compromised when viewed in a poorly-lit room because it is not backlit. You may have noticed that the monitor doesn’t track the heart rate and that is because the rower does not have that functionality. It doesn’t have EKG sensors on the handlebar and neither is the console telemetry enabled. Therefore, if you wish to keep track of your pulse in order to maintain your target heart rate zone you will have to purchase an external pulse rate device separately. The monitor displays workout data one at a time after every few seconds when the SCAN function is turned ON. It is also possible to set a preferred workout data to display constantly without changing. The console is powered by battery hence the monitor automatically hibernates when there no activity on the rower for a few minutes to save power and also turns ON when activity resumes. However, the monitor could also be turned ON/OFF through the start/stop button. 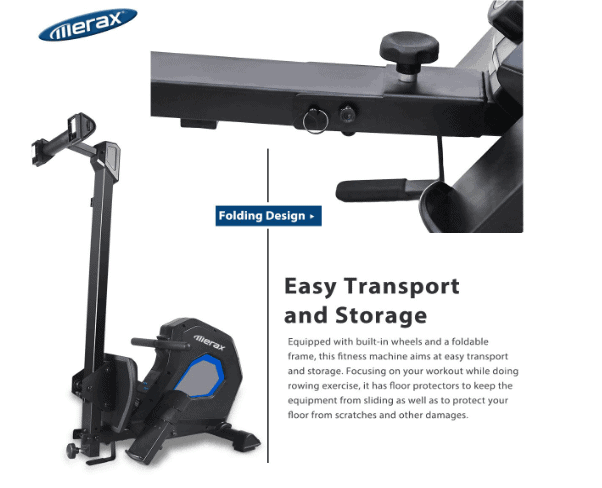 The Merax Adjustable Magnetic Resistance Rower doesn’t have any accessory available. However, you must find a way to keep water handy in order to stay hydrated at all time you are on the rower. This rowing machine is not compact in the assembled form but it is when folded up. It could easily be folded up to reduce its overall assembled dimensions to 26’’ long by 16’’ wide by 49’’ tall. This means little space is required for storage; the integrated transport wheels make it portable. This rower has a favorable Amazon approval rating at the time of this review. This shows that it is a popular rower that is well accepted by most users. 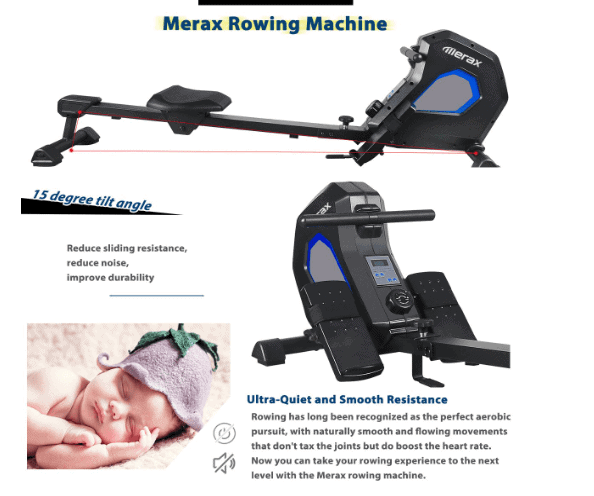 The Merax Adjustable Magnetic Resistance Rower is shipped in a box with dimensions of 48’’ long by 23’’ wide by 16’’ tall. The shipping cost is determined by the vendor you are purchasing from: that said, some vendors such as Amazon provide free shipping and delivers within days of order placement. The assembly of the Merax Adjustable Magnetic Resistance Rower is pretty easy due to the fact that the major components are preassembled. There are only parts such as the front and the rear stabilizer bars, the seat, the footrests that need to be attached to the core unit; although, the rail needs to be connected to the front part of the rower. The package comes with an instruction manual that walks you through the assembly process and the tools required for getting the job done. It won’t take up to an hour to fully assemble it. As aforementioned, this rower is basically maintenance free because no major maintenance is needed. Simply make sure to examine the unit for any loose or broken part before use to avoid an accident or further damage to it. Also, endeavor to keep it clean from dirt and sweat before and after use. 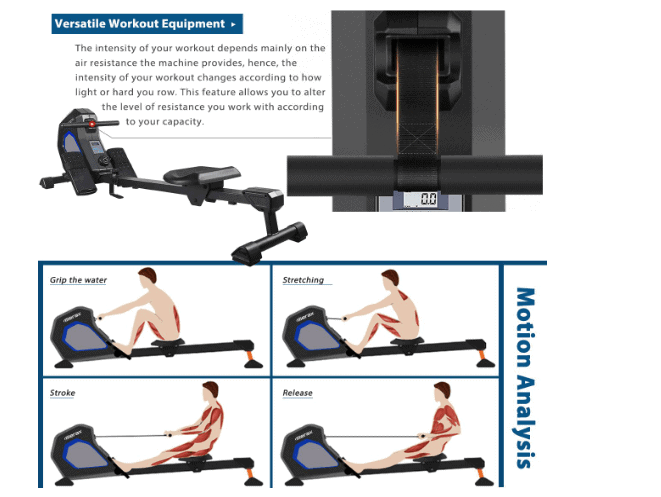 The Merax Adjustable Magnetic Resistance Rower is an affordable rower with good console/monitor that tracks workout values that keep you motivated and focused. It is durable and very stable to support any level of intensive workouts. Its operation is quiet and even though it is large it also has a space-saving design.